TOMRA Sorting has a solution for sorting fresh and frozen French fries. 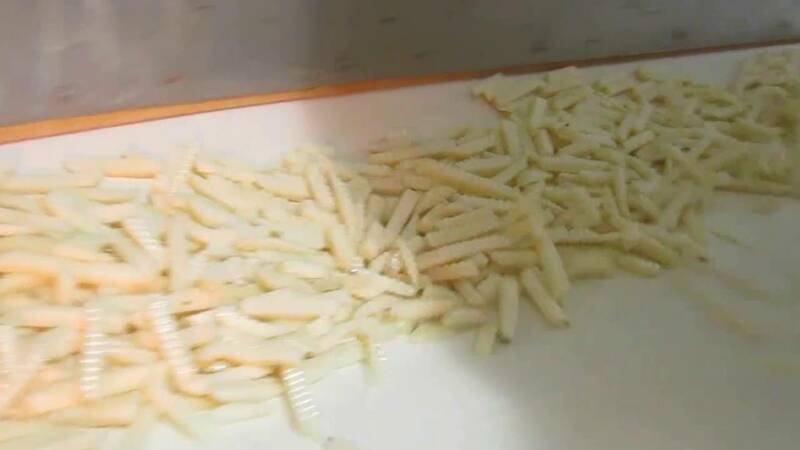 TOMRA’s sorting machines are able to sort fresh and frozen French fries, peeled or with the skin. The French fry sorters detect and remove green, brown, blue, black discoloration and clumps. TOMRA also supplies complete sorting, peeling and process analytics equipment for French Fry processing lines to enhance performance, increase yield, productivity and competitiveness. TOMRA Sorting Food is one of the largest producers of sorting and peeling equipment for the French fry industry. Today 75 % of the world’s French fries are processed using TOMRA equipment. For over 40 years TOMRA has innovated by working with its customers to understand their requirements and needs for reliability, efficiency and consistency. From complete processing lines to individual sorting and peeling machines, we have solutions that deliver. TOMRA Sorting has caused a French fry revolution in the potato processing industry by introducing Sort-to-Spec. Discover more about this new revolutionary feature. Seeing is believing. Read why Kaida decided to invest in TOMRA's French fry sorting and peeling solutions, and obtained a high efficiency and low peeling loss. Since 1951 Kadi has been an innovative manufacturer of potato products and other frozen foods for the Swiss foodservice. Enthusiastic chefs create the favorite dishes of the Swiss people daily. It goes without saying that in Kadi’s strive for consistent quality management they use the latest technologies and that’s where TOMRA comes into the picture. Read their testimonial. Read the success story about Agristo (Belgium, French Fry industry) and discover how TOMRA’s Genius sorter was able to anticipate new tendencies and customer requirements. Read the success story on Aviko (Netherlands, French Fry industry) and discover why they installed TOMRA’s Genius optical belt sorter in three of their processing plants. Oerlemans Foods is one of the leading specialists in growing and processing frozen vegetables, potatoes and fruit. Oerlemans joined forces with TOMRA Sorting Solutions and decided to invest in a brand new steam peeling processing line. Read the story of Oerlemans (The Netherlands, potato industry) and be inspired by their success. Hoff Norske Potetindustrier (Norway, potato industry) also wanted to improve the yield of their steam peeling line. Find out why they decided to partner with TOMRA Sorting Solutions. TOMRA’s French Fry sorting solutions boost throughput and availability while at the same time increasing yield, quality and food safety. The TOMRA 5A sorting machine brings more than 98% removal rate of foreign objects, quality inspection and peel quality control to the table. Running the highest capacities in the industry, this process potato sorter significantly increases the level of food safety and yield. Agristo invested in two new optical sorters and one upgrade of an older installation. After an extensive market analysis, the potato processor decided to consign this project to TOMRA. The most important reason why they chose TOMRA above competitors was the fact that TOMRA’s Genius sorter was technologically the pick of the bunch and was furthermore able to anticipate new tendencies and customer requirements.